Dimensions 0.25 by 6 by 8.50 in. Fantasy literature, American; History and criticism. An indispensable anthology of brilliant hard-to-find writings by Poe on poetry, the imagination, humor, and the sublime which adds a new dimension to his stature as a speculative thinker and philosopher. 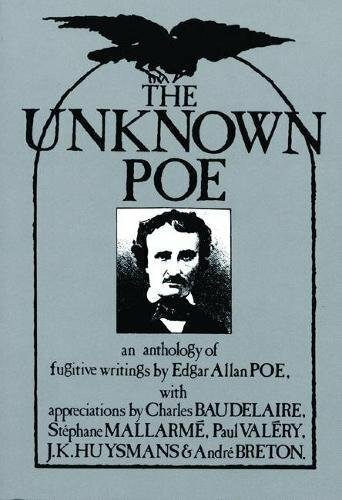 Essays (in translation) by Charles Baudelaire StÃ©phane MallarmÃ©, Paul ValÃ©ry, & AndrÃ© Breton shed light on Poeâs relevance within European literary tradition. These are the arcana of Edgar Allan Poe: writings on wit, humor, dreams, drunkenness, genius, madness, and apocalypse. Here is the mind of Poe at its most colorful, its most incisive, and its most exceptional. Edgar Allan Poe's dark, melodic poems and tales of terror and detection are known to readers everywhere, but few are familiar with his cogent literary criticism, or his speculative thinking in science, psychology or philosophy. This book is an attempt to present his lesser known, out of print, or hard to find writings in a single volume, with emphasis on the theoretical and esoteric. The second part, "The Friend View," includes seminal essays by Poe's famous admirers in France, clarifying his international literary importance. America has never seen such a personage as Edgar Allan Poe. He is a figure who appears once an epoch, before passing into myth. American critics from Henry James to T. S. Eliot have disparaged and attempted to explain away his influence to no end, save to perpetuate his fame. Even the disdainful Eliot once conceded, "and yet one cannot be sure that one's own writing has not been influence by Poe." Edgar Allan Poe (1809-1849), born in Boston, Massachusetts, was an American poet, writer, editor, and literary critic. He is well known for his haunting poetry and mysterious short stories. Regarded as being a central figure of Romanticism, he is also considered the inventor of detective fiction and the growing science fiction genre. Some of his most famous works include poems such as "The Raven," "Annabel Lee," and "A Dream Within a Dream"; tales such as "The Cask of Amontillado," "The Masque of Red Death," and "The Tell-Tale Heart." About: An indispensable anthology of brilliant hard-to-find writings by Poe on poetry, the imagination, humor, and the sublime which adds a new dimension to his stature as a speculative thinker and philosopher.